Since the 80s, aerobics took the world of exercise by storm. Different from high intensity workouts used by professional athletes before, aerobics is a moderate exercise that is effective in improving one’s overall fitness and can be done at Frothingham Park every day of the week and at anytime. After being developed by Dr. Kenneth Cooper, regular aerobics exercises and routines had been enhanced and were given innovations since its inception into the mainstream of modern life. A big part of the appeal of aerobics on almost everybody is the fact that it is simply any moderate physical activity that can be performed continuously for a certain length of time. This type of exercise works the body at the lower end of the target heart rate area, causing the heart and lungs to adapt and become strong. Because of this, aerobics is known as the best cardio and weight-loss exercise routine. Most bodybuilders attest that aerobics provide a sustained calorie-burning effect not matched by any exercise. The best aerobic exercise for burning fat and losing permanent weight will depend, of course, on the individual’s fitness level. If one has low fitness levels (most often, people who are just starting out), walking or step aerobics would probably be best. For starters, the best aerobics would include walking, running, jumping rope, ski machines, treadmills, rowers, health riders and more. If you are just starting out or have not been working out lately, the best starter program is walking. Even if the fat-burning potential in walking is low, this is a great routine for beginners. In time, on the advice of your trainer and doctor, you can step up your routine. Perhaps, you can later jog and increase the intensity level in your fat-burning. 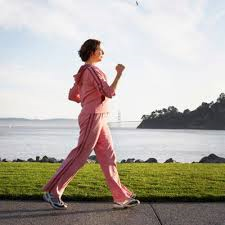 Running or jogging, the logical next level after your walking is rated the best aerobic exercises by many experts. It has a high fat-burning capacity, and if done with consistency, will produce obvious results every practitioner can feel and see for themselves. One should be on alert, though, on the danger for individuals to over-train. The name of the game is moderation, especially if you have some medical history of cardio-vascular problems. As always, consult your doctor first. Cycling, either on a stationary bike or a real one, is another fun and excellent aerobics routine. Cross-country or mountain biking not only gives you the exercise benefits you want, but will also get you to see scenic places that can excite the mind. In treadmills, you can combine walking, jogging and perform resistance training as well. The possibility of doing high intensity exercise routines in treadmills makes them very effective aids in your fat-burning goals. This is also true with other exercise gears in the gym like rowing machines. In rowing, the whole body routines can greatly help in burning calories. On the advice of your trainer, you may add a light weight training session to your aerobics. This might be done at least thrice a week. Weight training with aerobics is a potent combination for burning fat as well as preserving and toning your muscles. In all of these, the main frame of mind of the exerciser should be consistency. Aerobics needs moderation. Anything more intense is another exercise program.